A fragment of a silver denarius of Antoninus Pius dating to the period AD 152 to 153 (Reece period 7). COS IIII reverse type depicting Annona standing left holding corn ears and resting left hand on modius resting on prow. Mint of Rome. cf. RIC III, p. 53, no. 221 var. 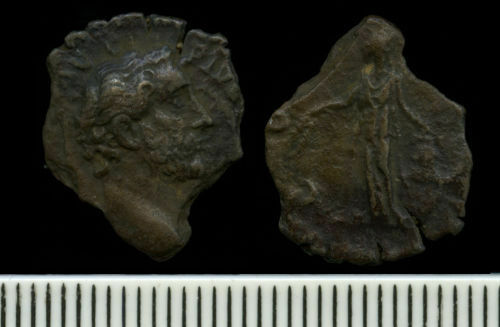 This coin is a variant of the cited RIC type as it depicts Antoninus Pius bare-headed rather than laureate on the obverse. It is noted by Strack. The coin is incomplete and may have been deliberately cut, following the line of the emperor's bust on the obverse. It is also possible that the circumference of the coin was also notched in the manner of a Republican 'denarius serratus' although it is difficult to be certain as so little of the circumference remains. Evidence of reuse: The coin is incomplete and it may have been deliberately cut following the line of the emperor's bust on the obverse. It is also possible that the circumference of the coin was also notched in the manner of a Republican 'denarius serratus'.